With less than a week to go (!!!) before I leave for my yoga teacher training, I've been keeping this intention in my mind to simplify. I've intentionally left space in my schedule to finish some to-dos and take time to pack light, so I don't go into my training feeling overworked and with an overly cluttered mind. I have a history of overpacking. It always starts out with a grandiose plan to keep it simple and pack only what I need. Sometimes, I manage to pack light...only to throw in 10 more things at the last minute. It's a fear of missing out (FOMO) or contemplating the "what ifs?" What if I need an extra outfit or those other pair of shoes? I've certainly gotten better at packing lighter when I travel, but I always end up wearing the same few (often simple) outfits. There's always clothes in my bag that I didn't wear at all when I get home. It's the same with my closet - I'll end up holding onto something because "what if" I need to wear it once to a party in three years. 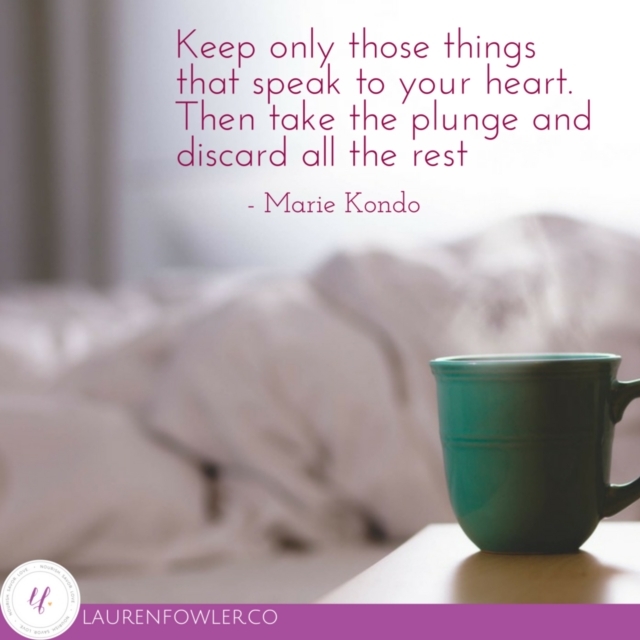 A few months ago, I read the oh-so-popular book "The Life-Changing Magic of Tidying Up" by Marie Kondo and finished it in a day (I was hooked). It's a short book all about simplifying your closet and house based on the intention of joy. It makes sense - I know that when my house is messy and cluttered, my mind feels cluttered. When it's cleaner and filled with things I love, my mind does feel clearer. I want to fill my closet and house with things I enjoy - and actually use - rather than keeping things in boxes or for special occasions only. I went through this process and found it incredible - I'm not a huge shopper or that cluttered, but I still had SO many clothes that I never wear but kept for some reason. Going through a lot of my other things, I easily created several bags of things that I donated or sold. I have become more intentional about what I do buy and bring into my space again. While I can't say my house is completely tidy and clean all the time (life is messy after all), I do feel like it's easier and more enjoyable to make simple decisions about what I want to wear in the morning. My closet is filled with clothes I really like to wear. With health, I often end up going back to the foundations. Simplicity in health should never be underestimated. The diet industry and social media often promotes a form of health that is complicated and complex - superfoods and supplements and fancy exercise equipment are marketed as must-haves. Yet, I often feel the best when I go back to the basics - eating mostly whole foods, heading outside to walk or hike to move, and getting good quality sleep. It's simple, but it makes me feel amazing. There's nothing wrong with going above the basics. After all, I do keep cacao nibs and chia seeds in my pantry (marketed "super foods"), and I have yoga equipment beyond a mat. I enjoy using these things, but I know I don't NEED them to support my health. They certainly won't give me a bonus towards "perfect" health. It's always a reminder that I need because of course, it's easy to fall prey to the marketing messages. On days that I am feeling self-doubt or insecure, I may feel like those new clothes or an acai bowl will make me feel amazing again. Yet, it's going back to simplicity in life that matters. Often, these simple acts - a walk outside with my dog or drinking tea with a book - are the most healing forms of self-care. Journal about simplifying. Ask yourself what feels "cluttered" in your life - your house, health, relationships, work. Think about what are the basic things you need in your life to thrive - for me, some of them would be movement, nature, and good food. Head to your closet. For me, I found simplifying my closet is the best place for me to start. Start with your shirts, and ask yourself "does this bring me joy?" for each item. Afterwards, you could host a clothing exchange or donate your clothes. Turn off social media for a weekend (or full week!). Turn off the marketing messages for a week to see how you feel. When you turn off social media, you suddenly have space in your life. You'll finally have time to do the things you put off - like getting outside for walks, cooking, or reading. Cook simple meals. Quite often, my meals aren't fancy Instagram-styled food. What I eat a lot of the time is pretty simple - salads, soups, bowls with random ingredients, curries. Occasionally, I do follow recipes to create other meals, but I am quite satisfied with a variety of simple meals. How are you going to use the intention of SIMPLIFYING in your life this week?